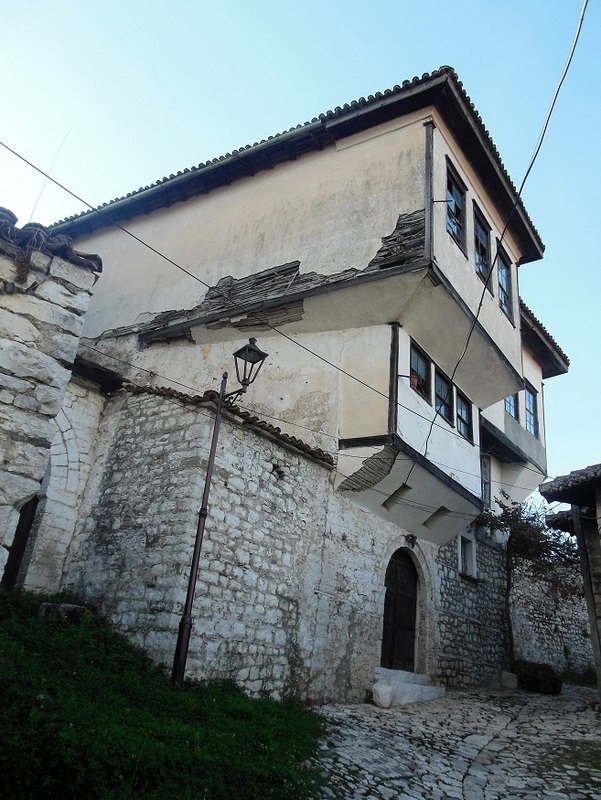 Now if I told you that there’s a town called Berat in Southern Albania with UNESCO protected Ottoman era houses, a romance novel-worthy castle, and an exquisite icon museum, you’d probably want to go, right? Berat is gorgeous but also relaxing and super-duper friendly. Let’s make that gorgeous, friendly, relaxing and budget friendly too—-our lovely guest house was less than €20 a night, including a lush breakfast, a welcome Turkish coffee on arrival, pomegranates picked straight the tree outside our room, and a glass of our host’s homemade wine. We headed straight uphill through the cascade of white ottoman houses to the icon museum (more on that later) where we stayed until closing time. Then we toured the castle sites. We especially loved the 13th century Holy Trinity Church which we enjoyed with the soundtrack of two simultaunous calls to prayer accompanied by howling dogs. After the castle we hustled about from landmark to landmark. 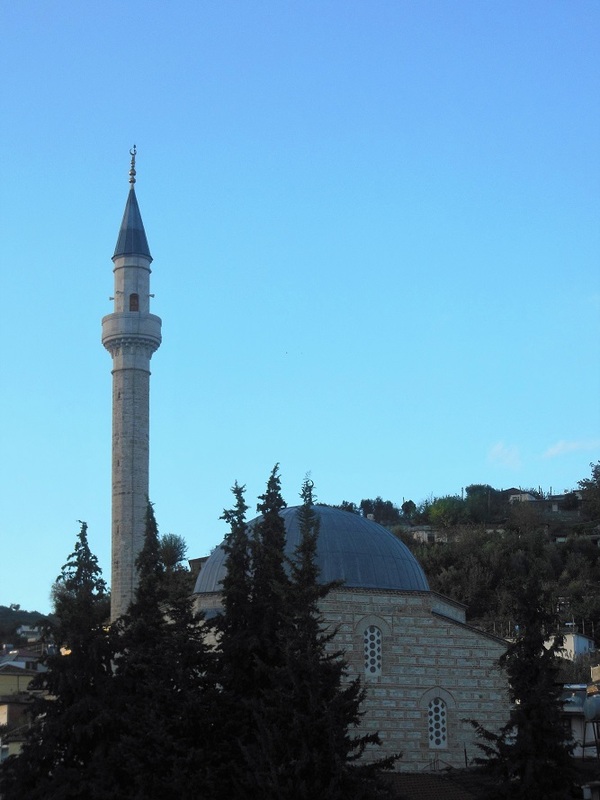 This is the Leaden Mosque, c. 1555. 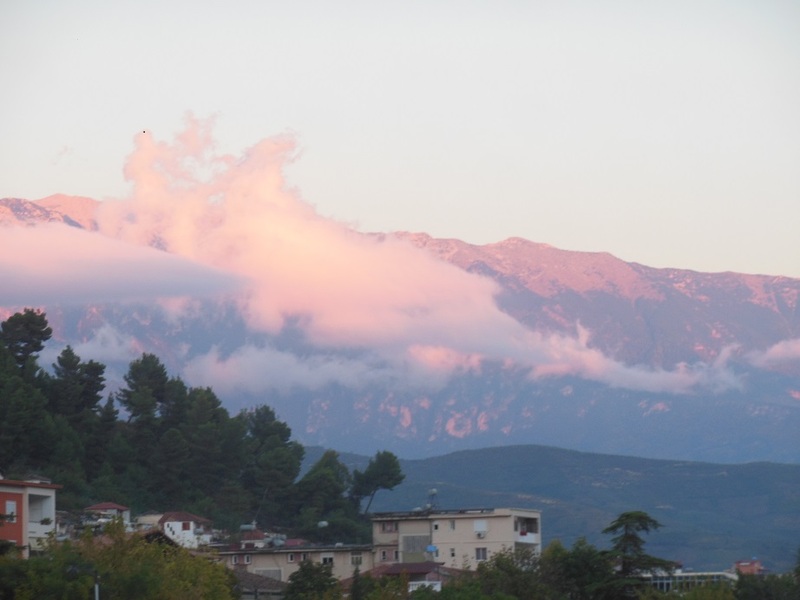 At dusk as the clouds over Berat turned to cotton candy and we met a local man, Agim whose name means “dawn”. Agim told us emphatically how much Albanians love Americans and then recited a history of American presidents with an emphasis on his favorites: James Madison, Abraham Lincoln, Woodrow Wilson (who advocated for Albanian independence) and Bill Clinton (who interceded on the behalf of the Albanians in Kosovo during the breakup of the former Yugoslavia). Agim then gave us some serious advice about a certain Republican candidate in the upcoming American election “He is a dangerous racist and he says terrible things about women. You should not vote for him. If I were American, I would vote Hillary Clinton”. Thank you Agim—good advice from a resident of country that suffered under a dictator for 40 years. We’ll be sure to take the early voting option as soon as we’re back in the states. Reluctantly, we headed back to our hotel and found ourselves in a promenade. People, you should know this about me: in addition to loving medieval art and snacking, I absolutely adore the Mediterranean evening stroll, known in Italy as the passeggiata. In Albania, the stroll is called xhiro and it is delightful. We joined the crowd slowly cruising down Boulevard Republika, teenage girls in high-waisted jeans locking arms, young men with man purses and sweat pants, old couples with boxy suits and tots with their parents all enjoying the warm autumn air. We reached the end of the promenade and even though we needed to get to bed for an early morning bus, we said, “What the heck!” and strolled along with the xhiro back in the other direction. When we reached the end of the promenade a second time all the lights cut out along the boulevard, leaving crowded cafes in the dark and all the strollers under the light of the stars. 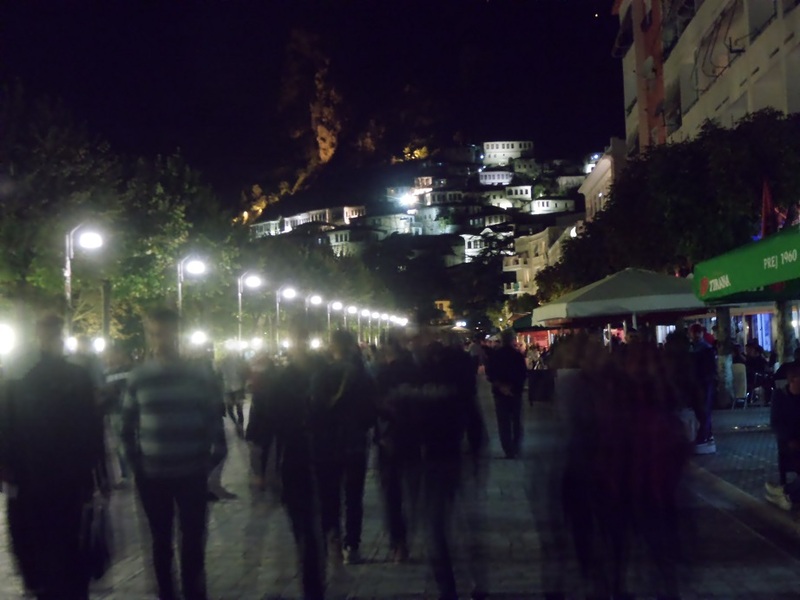 Electrical outages must be a common occurrence in Berat, because the people did not react much, just continued walking and sipping coffee in the dark. “What the heck!” we said again followed the xhiro a third time under starlight, while cell phone flashlights lit up around us and slowly the sound of generators buzzing filled the night and café lights popped on while we walked arm and arm back to our guest house. 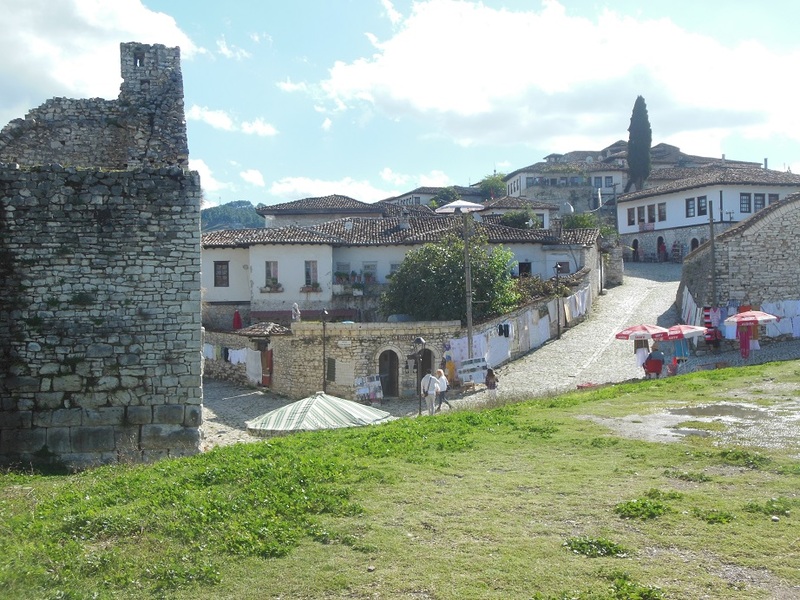 How we got to Berat : bus from Durrës. Beautifully written post! I am actually from Albania and I visited Berat for the first time this year. Beautiful city isn’t it. Thank you Tatjana! Yes, I recall seeing your post on Berat and it made me highly anticipate our trip. 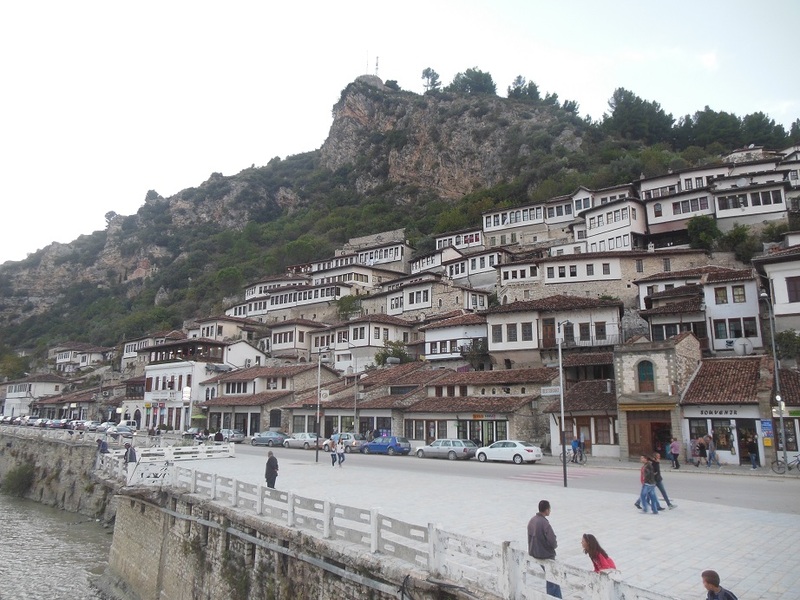 I did not look as fashionable in Berat as you did, however…..
Berat sounds fantastic. I really like your photograph of the promenade, very atmospheric. It is truly a lovely city in October, with warm light and trees full of pomegranates and figs. As always, a joyous journey with you. Holy Trinity looked wonderful. Any more photos of that beautiful little church? And I loved the coffee cup. Safe travels WOB and HOB. Thanks for following us through beautiful Albania, beppel2014. I do have so more pic of the church so hopefully I get a chance to post them when I get more internet time. For the most part no photos were allowed in churches (and museums too, grrrrrrrr). 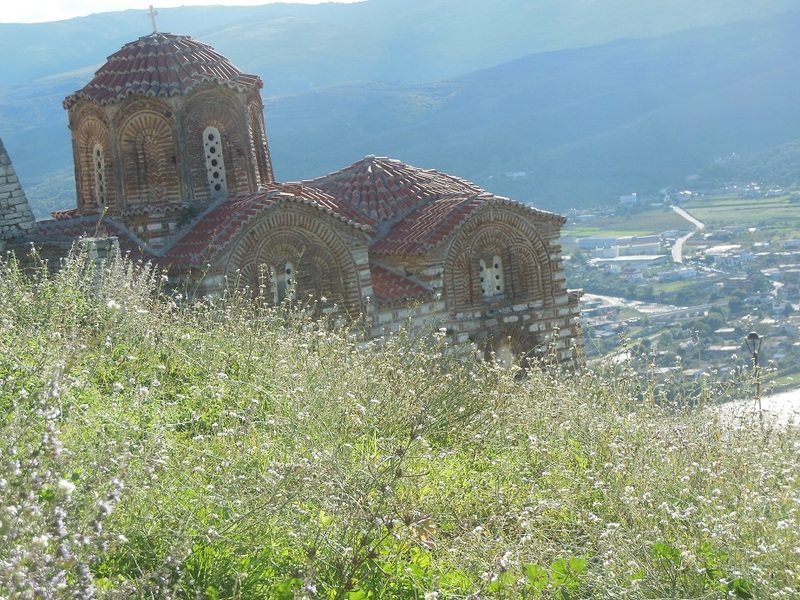 We did have a chance to take some snaps in a tiny orthodox church we hiked to outside Korce. I’ll post those sooner or later. Wouldn’t mind interrupting a xhiro for a coffee in that lovely cup. What a wonderful colour. 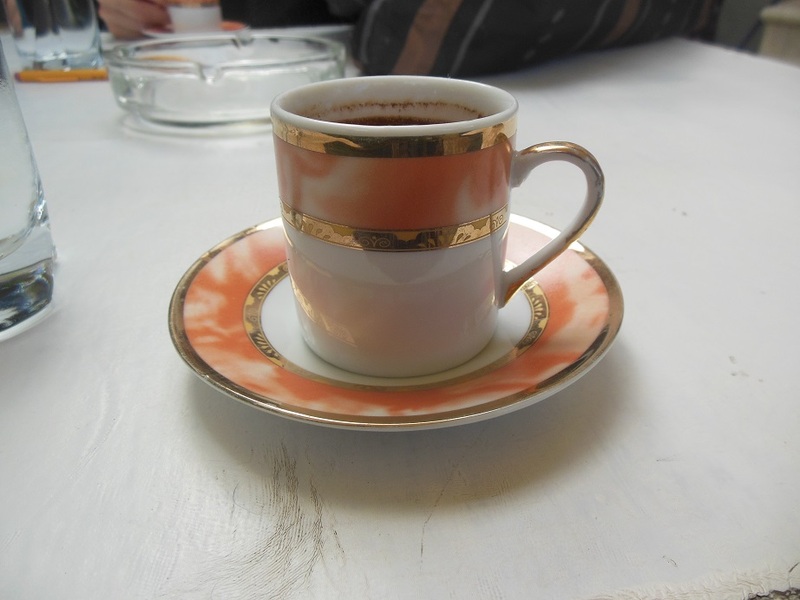 Next time you’re in Albania order Café Turk, which is their version of Turkish coffee. I can’t promise the cup will be this pretty though. I encourage you to visit—not to far of a flight from France! Quaint adorable place.Been inside the church? Yes, Berat is truly adorable but no, we weren’t able to go inside the church. Getting inside churches was a challenge in Albania, though we manage to get some locals to open one near Skhoder. I’ll post pictures of that soon.